Home→Our Journey→On the Road→Free at last! Finally it’s happened! After three years of planning and two years of intense work on the house, we are now officially full timers (aka homeless). Woo hoo! Never thought that the day would come (bet you didn’t either) but on Friday, September 27th, we turned the keys over to the new owners, Lauren and James. 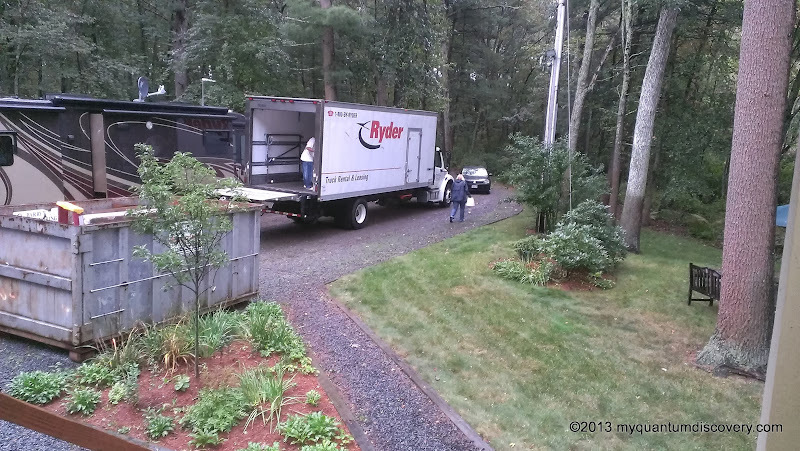 Those of you who have been through the arduous task of moving know all to well what an overwhelming job it is. Ours was no different. In fact, maybe it was worse since we had been working so long getting our house ready and then our house sold so fast, we didn’t have a chance to catch our breath after finishing all of the year long, continual projects. Although we had two months to prepare for leaving the house, it still didn’t seem like enough time. The sorting, packing and moving of all our stuff was constant and never ending. Each day it became harder and harder to get up out of bed to face another day of drudgery, packing and lugging. Day in and day out we had to make decisions on whether to keep each item, move it aboard the motor home, store it, donate it or throw it in the dumpster (our 3rd). At the end of each day, not only were we physically exhausted but we were mentally exhausted as well. Too many decisions! How many times did we mumble to each other “I never want to do this again”? We probably said that the last time we moved 17 years ago but somehow when you have dreams to fulfill the memory of the pain you felt previously moves to the back burner. In addition to getting everything out of the house, there were a few house projects still left to be done before the closing. And then there were a number of projects Rob wanted to complete in prep for traveling on the motor home such as installing a new dishwasher, reconfiguring storage by adding shelves to some of the cupboards, improving the pantry support, reconfiguring the wet bay layout, and numerous other things. There was still so much to do, it was totally overwhelming and difficult to prioritize. But somehow we managed, although a few of the motorhome projects did not get done! Yet. In the midst of all this, there seemed to be a constant parade of U-Hauls, moving trucks and SUV’s in and out of our driveway as the bedroom set, Rob’s beloved Uni-Saw, our love seat and recliners, grandfather clock and many other items were picked up by friends and family. Finally, with all the furniture gone (except the items Lauren and James had purchased), on September 15th we moved out to the driveway and began to live aboard the motorhome for real. 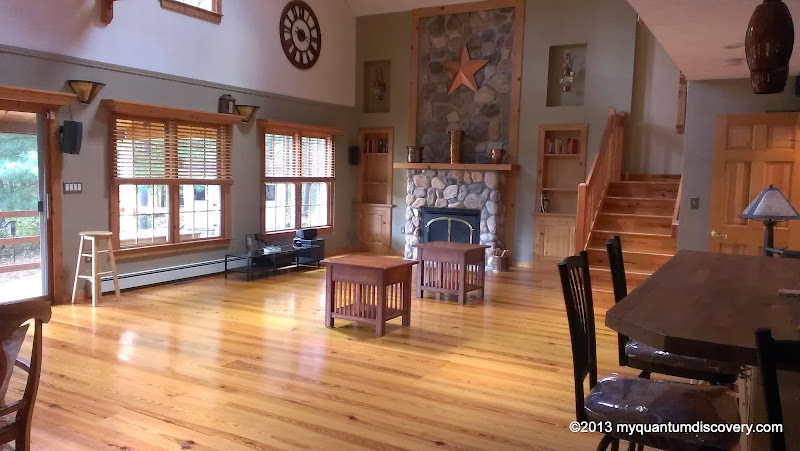 Although we had recovered from the emotional trauma and accepted that our house was now sold, I have to admit it was tough watching all our furniture go out the door! But that didn’t last long. With the majority of our personal items now gone, we became even more emotionally detached – with the departure of our stuff, our “home” was gone – now it was just a wooden structure (a very nice one to be sure) that would soon belong to someone else. 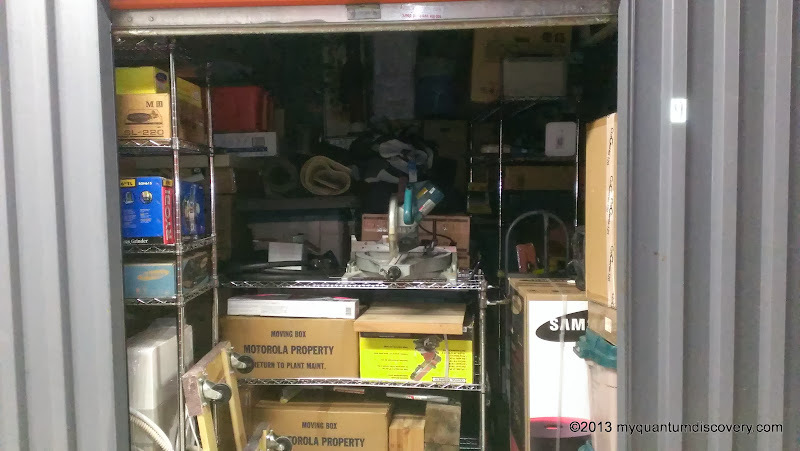 With a sore back and a sore knee, my “I’d rather do it myself” hubby suggested that we hire movers to lug the myriad of boxes and tools to our storage unit. Boy, that was music to my ears! 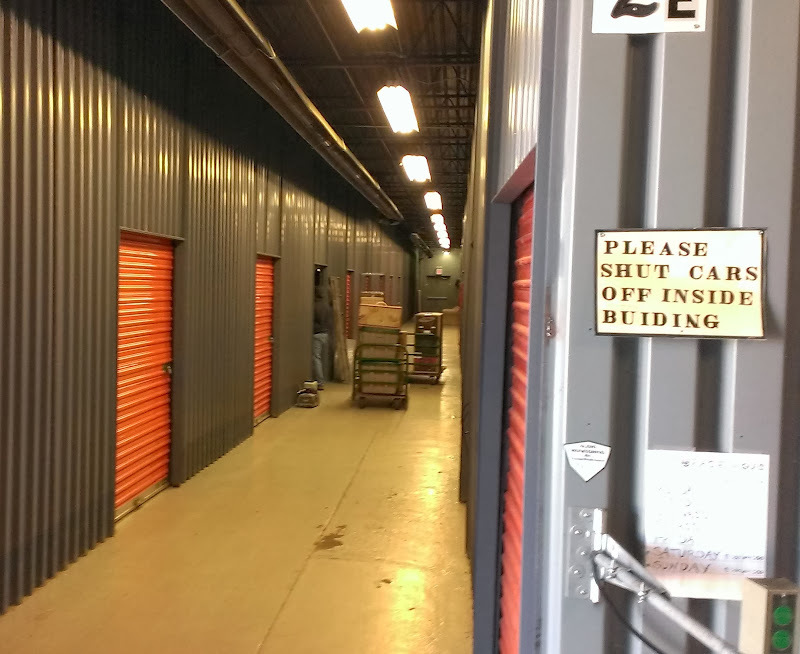 Our storage facility is affiliated with U-Haul and they had told us that they could help with moving so I contacted them. 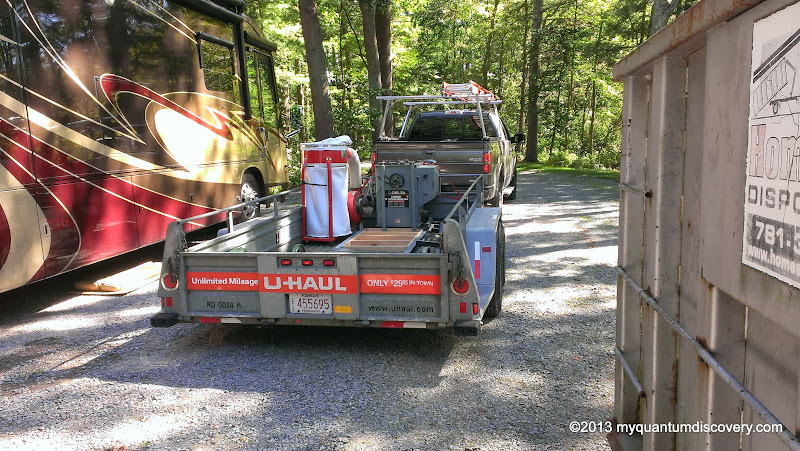 We arranged for a one way rental of a 14′ U-Haul truck at a local U-Haul facility and hired some movers (Israel & Brian) from the storage facility to load it up and take it to our storage unit in RI on September 24th. Now we were under the gun to get everything packed. Luckily we weren’t keeping any of our furniture – our buyers purchased some of it and the rest was either sold or given to family members. Fortunately moving everything to the storage unit went without a hitch except now our rather large storage unit is chock full of stuff. 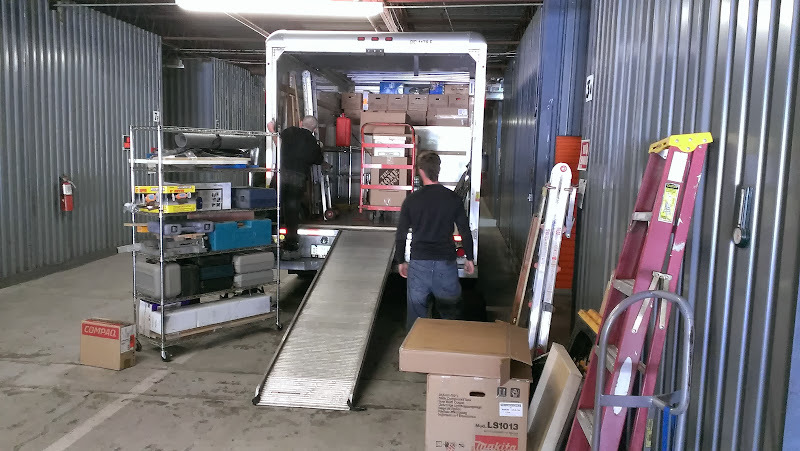 Well, actually I lied – we did have one little glitch – after the truck was fully loaded and we were about to leave, the guys noticed that one of the dual rear tires on the passenger side was flat. Whoever had the truck before us, must have run into something as the tire was badly damaged. EGADS, now what? So much for quality control at U-Haul! Well after a lot of discussion, Brian (he was going to drive) decided that it was okay since we were nowhere near the weight limit of the truck. 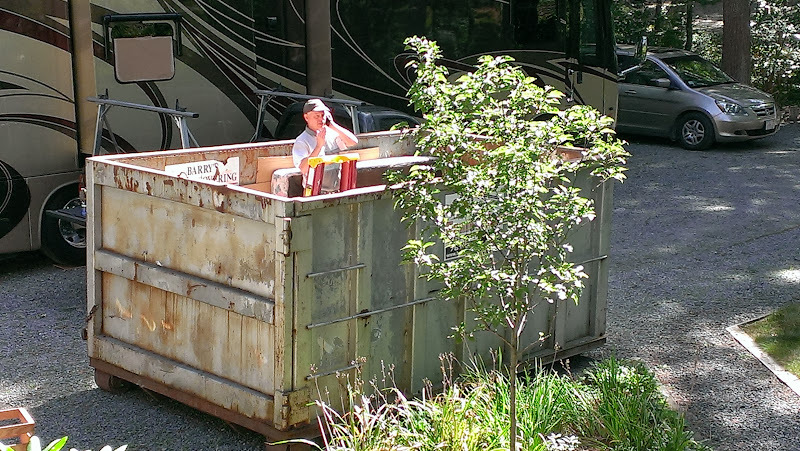 Luckily we arrived at the storage facility all in one piece. Our total bill for the move was about $300 – well worth it! 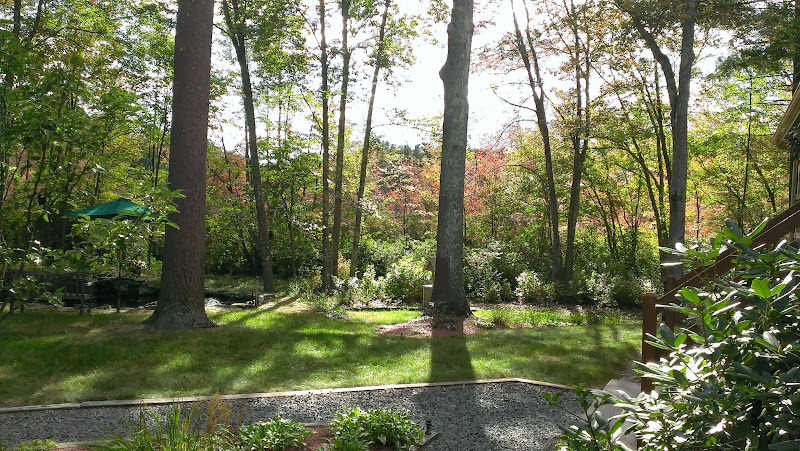 Now that the move was over and done, with the motor home fully loaded (perhaps even overloaded) late in the day on Wednesday, September 25th, we drove our new home to Normandy Farms which is located in Foxboro, about a 20 minute drive from Norton. 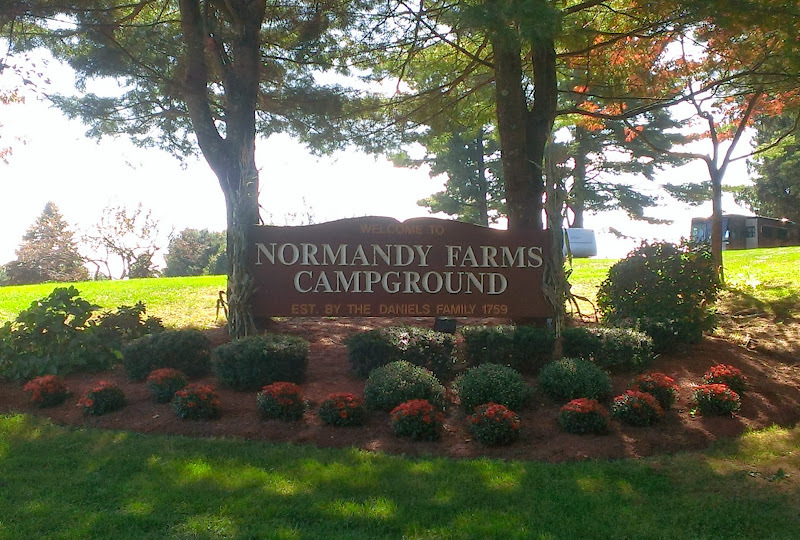 Normandy Farms is perhaps one of the best campgrounds in the New England area – we’ll write more about it in a later post. As we proceeded out of the driveway we faced the challenge one last time of turning onto Meadowbrook Lane, barely scraping by the mailbox – it was so close I had to to pull on it to get the extra 1/2 inch Rob needed to make the turn. Thank goodness, we won’t have to do that again. Shortly after we arrived at Normandy Farms there was a knock on the door. One of the staff members handed us a gift bag from Lauren and James. Inside was a bottle of gin and a lovely card. Thanks again Lauren and James! See I told you they were the perfect buyers! I think they were very appreciative of our spending one entire Sunday with them, explaining (or at least trying) all of the various systems in the house (sprinkler, pond filter, automated lighting system, security, etc. etc.). I’m sure the reason for the gift wasn’t in appreciation of the accidentally burned pizza that I served them that day! On Thursday morning at 7:30 am we drove back to the house to continue cleaning and packing more stuff. More boxes and another run to storage. Jeesh, when does it end? Then back to the house to do more cleaning, finally finishing about 8:30 pm. One more day to go – good thing since I’m not sure how much longer we could keep up this pace! Arriving at the house at 7:30 am on Friday, we finished packing even more stuff into the van. Lauren and James were coming over at noon to settle up on the household items they had bought as well as the pickup truck. Then at 1 pm the realtors showed up for the walk thru. At 2 pm the closing took place at the Taunton Registry of Deeds. Not much for us to do except sign a few papers and watch Lauren constantly smile from ear to ear! And then it was done! The keys were now in her possession. Walking back to the parking lot, we were jumping for joy! Before we left Ruth, our realtor, said she had a little something for us – a huge gift basket. Back at the campground we opened it. That little something turned out to be: two bottles of wine, a lovely huge gift bag of Lindt Lindor Chocolate Truffles (to die for), lovely cocktail napkins and a Mobil Gas gift card! WOW! Thank you Ruth! We’ve sold a number of properties over the years and we have to say that this was the smoothest sale we have ever experienced. 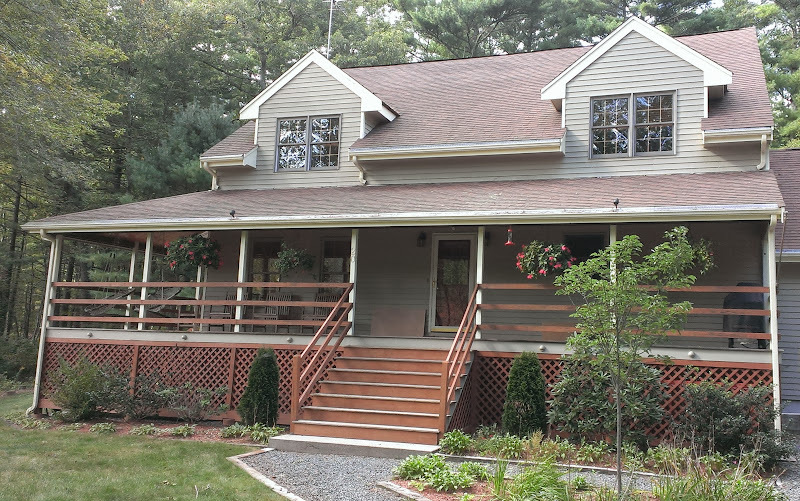 It was so easy to turn our beloved home over to Lauren and James who were the perfect buyers and so easy to work with. Being first time home owners, they not only bought some of our furniture and home decor but also purchased our 2003 Toyota Tundra truck (complete with the snow plow and driveway groomer), all of the yard tools in the shed and garage and were nice enough to allow us to leave other miscellaneous items. All of that saved us a lot of time and effort. Since they were so excited, despite our total exhaustion, we couldn’t help but be thrilled and excited for them. 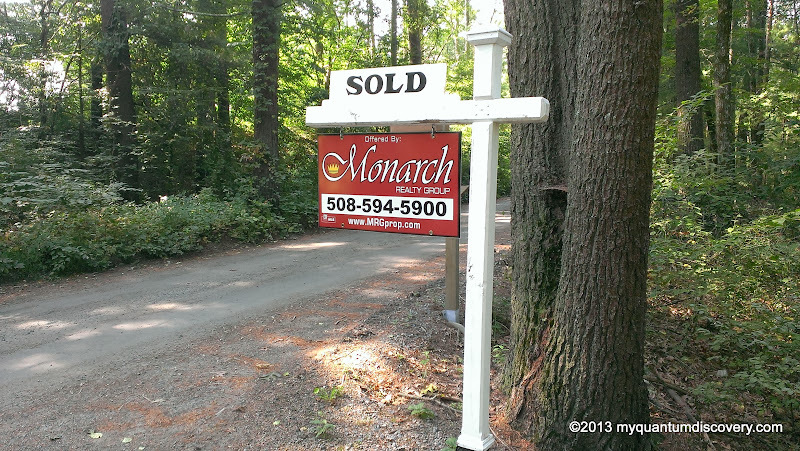 And then there was our realtor, Ruth DiPietrantonio from Monarch Realty in Mansfield who guided us through the entire sales process making it so very smooth and painless. Her husband, Eric, who isn’t a full time realtor but does have his realtor license, helps her out. Both are very knowledgeable, very responsive and very personable – we can’t say enough good things about the two of them. So overall did we feel any emotion about leaving the house? Well yes but it was good! We thought we would feel a little sad, but nope – the only emotion we felt was happiness that after three years of planning and hard work, we were finally finished, the new owners were fantastic and the house was in excellent hands and we were ready to move on! Let our new journey begin! Oh, my God! its done, our friends are trailer trash, hardly the new home is bigger than my UK house… Really hope it all works out well for you and if it doesn’t you can come and live in our house in Portugal! Well when we get it built that is. Hey Ian, maybe we’ll take you up on that, we probably never mentioned that our new home has the ocean voyaging option 🙂 How is Portugal in the summer? Make sure you plan a space for us to park at the new casa. Also an outside mains hookup (50 Amp please) and a sewer dump station would be nice. Looking forward to a visit! Cheers! Can you actually believe you are now Happy Wanderers or is it still surreal? Wishing you Happy Trails.